Objective: Investigate the relationship between the subcategories included in the Foot Health Status Questionnaire (FSHQ) and body mass index (BMI). Design: Cross-sectional study of people attending a general health screening clinic. Subjects: Fifty participants aged between 40 and 60 years filled out the FHSQ and were included in this study. These were divided into the three groups according to the BMI classification of underweight to Class 3 obesity. Measurements: Demographic variables, blood pressure, BMI as well as medical history were recorded. Relationships between the subcategories of the FSHQ and BMI were investigated. All statistics were deemed significant if p < 0.05. Results: We found that there is a significant correlation between BMI and foot pain (p = 0.047), foot function (p = 0.004), footwear (p = 0.007) and general foot health (p = 0.013). Conclusion: The foot health questionnaire is an internally consistent, all in one foot health and function assessment tool, which indicated significant impact of BMI on pain, foot function and foot health, as well as choice of foot wear. These issues can ideally be addressed by primary care physicians to improve health and quality of life for people that are overweight through effective weight loss programs. Keywords: Obesity, foot health, Body Mass Index, Foot Health Status Questionnaire. Obesity is a significant health problem and the incidence of the condition is increasing. Studies by the World Health Organization have found more than one billion adults are overweight (body mass index [BMI] >25) and at least 300 million of them are clinically obese (BMI > 30). In Australia, the levels of obesity have been increasing by about one percent per year since 1980. The advantage of this questionnaire is that it is internally consistent and includes both physical and psychological variables. The focus of this project was to identify if an association exists between an increased body mass index and the four domains of the Foot Health Status Questionnaire. The research project was approved by the Charles Sturt University Ethics in Human Research Committee. Participants were selected via stratified random sampling from the Allied Health and Diabetes Screening Program database. Individuals had the questionnaire explained and any other questions answered prior to completing the FHSQ. Participants completed the FHSQ version 1.03. Missing items in the questionnaires (when fewer than 50% of the items for any one scale were missing) were assigned with the average value of the completed items for that scale as suggested in the instructions. 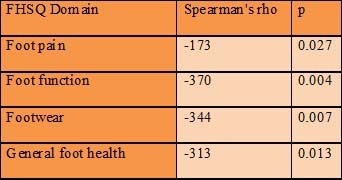 Statistical analysis was undertaken using Spearman’s correlation coefficient for non-normally distributed data. Significance level was set at p < 0.05 for a one tailed test. Data from 50 participants who had completed the FHSQ was analysed. Overweight was taken as a BMI greater than 25. Participant’s characteristics are presented in Table 1. The relationship between BMI divisions and FHSQ domain scores were analysed using Spearman’s rho correlation coefficient as the data was not normally distributed. 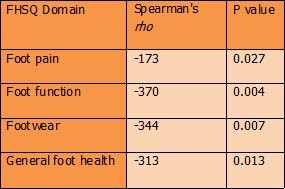 There was a significant negative Spearman’s rho correlation coefficient between increased BMI and foot pain, r(47) = 27, p < 0.05, foot function, r(47) = 37, p<0.01, footwear, r(47) = 34, P < 0.01, and general foot health, r(47) = 31, P < 0.05 (Table 2). These results indicate that as BMI increases the foot health domain scores decrease. Table 2 Correlation between FHSQ domains and BMI. Several studies and different questionnaires have addressed foot function and foot health. However previous work has not utilised the FHSQ as a tool, which combines both function and psychological aspects of foot health. The findings of the present study and similar findings from other authors clearly support the concept that obesity influences foot function. The main aim of this study was to identify if a relationship existed between increased BMI and foot health as measured by the four domains of the FHSQ, foot pain, foot function, footwear, and general foot health. This study showed that obesity has a significant effect on the level of foot pain, normal foot function, the adequate fit of footwear, and general foot health as determined by the FHSQ. 1. WHO. World Health Organisation, Global strategy on diet, physical activity and health. Available at: http://www.who.int. Accessed 14 October, 2008. 2. Hills AP, Henning EM, Byrne NM, Steele JR: The biomechanics of adiposity – structural and functional limitations of obesity and implications for movement. Obesity Reviews 3: 35 – 43, 2002. 3. Rejeski WJ, Focht BC, Messier SP, Morgan T, Pahor M, Penninx B: Obese, older adults with knee osteoarthritis: weight loss, exercise and quality of life. Health Psychology 21: 419 – 426, 2002. 4. Gravante G, Russo G, Pomara F, Ridola C: Comparison of ground reaction forces between obese and control young adults during quit standing on a baropodometric platform. Clinical Biomechanics 18: 780 – 782, 2003. 5. Lievense AM, Bierma-Zeinstra SMA, Verhagen AP, van Baar ME, Verhaar JAN, Koes BW: Influence of obesity on the development of osteoarthritis of the hip: a systematic review. Rheumatology 41: 1155 – 1162, 2004. 6. van Schie CHM, Boulton AJM: The effect of arch height and body mass on plantar pressure. Wounds 12 (4): 88 – 95, 2000. 7. Bennett PJ, Patterson CP, Wearing S, Baglioni T: Development and validation of a questionnaire designed to measure foot-health status. Journal of the American Podiatric Medical Association 88: 419 – 428, 1998. 8. Bennett PJ, Patterson CP, Dunn JE: Health related quality of life following podiatric surgery. Australasian Journal of Podiatric Medicine 32 (3): 164 – 173, 2001. 9. Landorf KB, Keenan A-M: An evaluation of two foot-specific, health-related quality-of-life measuring instruments. Foot and Ankle International. 23: 538 – 546, 2002. 10. Badlissi F, Dunn JE, Link CL, Keysor JJ, McKinlay JB, Felson DT: Foot musculoskeletal disorders, pain and foot-related functional limitation in older persons. Journal of the American Geriatrics Society 53: 1029 – 1033, 2005. 11. Han TS, Tijhuis MAR, Lean MEJ, Seidell JC: Quality of life in relation to overweight and body fat distribution American Journal of Public Health 88: 1814 – 1820, 1998. 12. Burns SL, Leese GP, McMurdo ME: Older people and ill fitting shoes. Postgraduate Medical Journal 78: 344 – 346, 2002. 13. Fontaine KR, Bartlett SJ, Barofsky I. Health-related quality of life among obese persons seeking and not currently seeking treatment. International Journal of Eating Disorders 27: 101 – 105, 2000. 14. Hakim Z, Wolf A, Garrison LP: Estimating the effect of changes in body mass index on health state preferences. Pharmacoeconomics 20: 393 – 404, 2002. Charles Sturt University, Albury, NSW 2640,Australia. This entry was posted in Uncategorized and tagged BMI, body mass index (BMI), foot health, Foot Health Status Questionnaire, obesity, Uncategorized. Bookmark the permalink.